SUMMARY: Quite a rollicking tale in which I did almost nothing at all. I try, but it's hard not to have dogs who are my favorites. First there was Amber, my first dog on my own, and amazingly special to me. Then, a couple of years after she died, there was Remington, who became perhaps my favorite to date. So perhaps you might understand why, when this came up on my facebook page last Friday as "Foster home urgently needed!" from a local rescue organization, I had to get in touch. 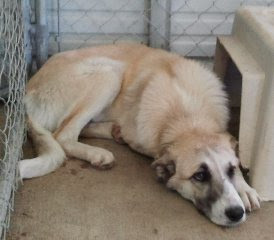 Her description: "Belle is a beautiful, young female Shepherd mix. Like the majority of shelter dogs, she is shy at first, but with a little attention, she warms up and is friendly. She is slightly dominant, but not aggressive. She is kenneled with a friendly pittie and they get along fine." I thought, "Hmm, maybe it's time for another big yella dog in my life again!" I've never fostered a dog before, so wasn't sure what was involved, but it seemed like that might be a good way to get to know the dog and decide whether she was for me. I sent email to the rescue and went to bed, got up early Saturday morning and went off to clean creeks. When I got home, there was email AND a phone message, saying, please get back to us ASAP because we have a ride for her this morning but they'll only be there from about 8:30 for a couple of hours. That afternoon, I got a phone call saying that they might have another ride for her if I was still interested. Turns out that Belle has only one eye. I said that that probably wouldn't work for dog agility, so I wasn't a likely adopter, but I'd be interested in finding out what's involved in fostering her. We had a long conversation in which I was pretty cautious and also pointed out that I had to consult my renter, as well. Yeah, it's my house, my life, but he lives here, too, and takes care of the dogs when I'm not home. I convinced him that I was very serious and sure, I'd owe him some big favors to be named later. I felt like I was trading baseball players with another team. Meanwhile, they reposted the rescue with this message: "Belle is a young female Border Collie x Shep cross. She only has one eye, is very sweet but scared in the shelter and they're going to put her down. Another rescue is willing to sponsor her if anyone could foster her. They will pay her vet bills if anyone can help her. She is in Wasco shelter outside Bakersfield. We have a ride for her up to the Bay Area. Time is very very short for this beautiful girl so if you can foster or know someone who can foster, please let us know as soon as possible." Then I got another message that they actually had a ride for her on Sunday if I could take her, and I said, um, sure, and got a little more serious in thinking about where I'd put a dog whom they didn't even know whether she was housebroken or ANYTHING. And thinking about what training I could do for her if she needed training. Like that. Then Sunday I got an email that there had been a mix-up at the shelter and another rescue group had gotten her so they wouldn't need me after all. So I went out for a few hours with my seester and her husby to the movies and lunch and shopping at REI, and while we were out, we made definite plans to go out of town for Memorial weekend. When I got home, there was another message that it turns out that the other rescue group didn't have a place for her and was going to bring her up here after all. I called back and said, um, ok, but I just made plans to go out of town next weekend, so I could keep her for a few days but not through next weekend, and she said that's fine. Then when they got her up to a vet up here to check her out, it turned out that there's an abscess on her face that the vet wanted to look at and keep her overnight, so they wouldn't need me until monday. (I wonder whether that had anything to do with her eye. Dunno. Didn't ask.) But the good news was they also had someone who was interested in possibly adopting her, so I might not have to keep her for very long. I said I'd be working at my client site monday during the day, so could they bring her over her in the evening? And we made plans for how we'd take all the dogs (mine and Belle) to the nearby park to introduce them, and had some discussions on what would happen if for some reason Belle did NOT play nicely with my dogs, and like that again. And I might have to have her for only one night because the potential adopter wanted to meet her on Tuesday evening, so I added those dates to my calendar. I started thinking about what I'd do with her at night (my dogs sleep on my bed) and what I'd use for a crate (i have soft crates and they might not work for a dog who's not thoroughly crate trained) and where I could put the x-pen instead, and so on. Monday at work, I got another email saying that the vet still didn't like the look of the abscess so he was going to keep her for another night, and then she was going to meet her potential adopter Tuesday night, so they didn't need me after all at all. I haven't checked whether she really was placed, or her health status, or anything else. I sure spent a lot of time on the phone and in email and in various conversations for something that never actually happened! But she did say that, if I hadn't offered to foster her, they wouldn't have been able to get her out of the pound, so in fact I did a huge good deed without having ever to do anything else other than offer. And then we had to cancel our planned out-of-town trip due to serious illness in seester's husby's family. Ah, well, at least my peaceful life with the Merle Girls continues. Wow, that you were even contemplating adding a third is amazing. And you probably saved her life. So it all worked out in the end! 'I'll just foster him at first to see if he gets along with the other dogs.' Hmmm, I think I've heard that somewhere before. Glad everything worked out for the best. Sometimes simply the desire to help is a big thing. I'm sure if Belle could understand she'd be thankful for your hand in things. Quite the story, not sure how you managed to keep track of all of that! I can totally relate to the logistics side of things you mentioned. I'm in the planning stages for getting a third dog and keep thinking of "hmmm, and how is such and such going to work..." Neither of my dogs are particularly welcoming of new dogs so it will definitely be a management thing for a while. Oh and throw a couple of cats in the mix, just for fun...! Anyway, funny how things work out sometimes, but all's well that ends well. She sure is a beautiful big yella dog. I was thinking about Walter, too, in the big-yella-dog lovers pantheon. Wow...a potential new addition. Even though it didn't work out sure cool you're thinking in that direction :) Hope you have fun hiking tomorrow! Well, I'm not REALLY thinking in that direction. It's just something that came up and is now gone. Tomorrow should be perfect weather for hiking--mostly sunny, in the 60s (F). Hope you all have a fun memorial day.